It was debated as to whether these shifters were made by Modolo or by Ofmega. They look similar to Modolo Kronos shifters but with some clear differences in design and material. It is also known that they were made by Ofmega. The question is, now, whether Ofmega made the Kronos levers for Modolo, which is unlikely. The 1st generation is clearly different to the 2nd generation: The "Ofmega" on the levers is embossed. The levers are smoother, with no bulge for the cable-head port. The finish is also more consistent and better than the 2nd generation. The second photograph, above, illustrates the differences. These differences tend to mean that the 1st generation shifters are more highly sought after. Unlike the Modolo Kronos shifters, there are almost no reports of the shifters breaking. Whether they were more robust in material or form is unclear but even the brittle-looking white shifters survive very well and are still, often, perfectly usable. As with all of the "composite" parts in the Mistral range, the shifters were available in five (possibly more) colours; black, white, pink, blue and yellow. However, it is possible that the 1st generation shifters were not available in yellow, as with the rear dérailleurs. All of the colour variants are rare, with (as usual) the yellows being the rarest; however, interestingly, it seems that more blue and white shifters can be found then those colour forms' front dérailleurs. The black forms are almost "uncommon" - far more being available then almost any other component from the group, even, perhaps, than black rear dérailleurs. Ofmega's "Mistral" goupset was amongst their most innovative. It included colour matched dérailleur sets, with colour matched pedals (called "Sintesi"; Italian for synthesis). The "Mistral" itself is a cold, northerly wind, often felt in the coastal regions of Southern France (wiki article). The colour matched dérailleur/pedal sets came in black, white, blue (Squadra Azzurra), pink (Maglia Rosa) and yellow (Maillot Jaune). The last three were named after important cycling artifices (to Italians). There may have been other colour forms (such as the sometime-reported red and green sets). At least one "silver" set has been seen. Ofmega found it hard to match brushed aluminium, so the set looks like grey but is definitely metallic and doesn't look like the white version at all. The very rare colours, such as the red and green, may have been one-off sets to celebrate victories in Spain or points jerseys in the Tour de France. The colours are not fast and will degrade in sunlight. No colour-form was common but, in general, the commonest colour-set is black, with the pink set being the next most common. Blue sets are moderately hard to find, with yellow and white sets being almost legendary. Coloured Sintesi pedals have now become very, very rare. There are catalogue shots of them, proving that they existed, but few examples have been seen in the wild for some time. Bob Sapovits, of the Bicycle Info Project has a copy of the Mistral page from the Ofmega catalogue. All of the "plastic" components used a high-strength "composite" for their bodies, with the dérailleurs using it for their upper jockey-wheel cage, as well as the jockey wheels themselves; this allowed Ofmega to colour-match all the parts pretty much exactly. 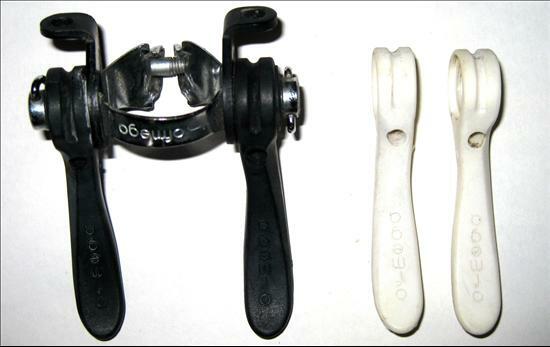 There were track pedals (only in black, apparently), see the Mistral Pista pedals page. The rest of the parts are alloy (except that, in some cases, some of the mechs had stainless steel bolts and adjustment screws). The composite appears to be a high grade thermoset plastic. Although the plastic has lasted very well (with only one report found, so far, of a rear mech braking). The other components were interesting too: the chainsets are beautiful, with the spiders looking like ninja throwing stars. There were bottom brackets, hubs and headsets in the groupset. There may have been seat posts and brakesets, too, but they must have been very rare. Ofmega did make coloured hubs (anodized red and blue) but the only ones seen so far have been in Super Competizione boxes, which may or may not have been original. It is not clear when this groupset was first manufactured or when the run ended. However, it is likely that they were first made in the early 1980s and ran through to the early 1990s. Ofmega rarely date any of their components (except their chainsets), which does not help. The earliest patents on the Mistral line were IT1194862B (1979) for the Sintesi pedal, GB2109892A (1982) for the crankset and FR2515604A1 (1982) for the dérailleur. That the later patents are from Britain and France suggests that there are probably earlier Italian patents hiding somewhere on their systems. As with many Ofmega groupsets, the Mistral set can be identified by the box it came in (other than the designs and the colours, etc...); in this case, as with the designs, it is an oddly brilliant black and gold mixture, often with a photograph of the component on the top. However, the Master groupo sometimes turns up in the same boxes. The track pedals come in a gold box, borrowed from the CX range. Ofmega SpA was an Italian motorbike and bicycle components company producing high quality components in a variety of ranges: including Master, Mistral (for both road and track), Mundial (a cheaper, slightly later version of Mistral), Competizione, Super Competizione, Linea, Premier, Gran Premio and CX for the road and Sierra for mountain bikes. There were probably more, including at least one other pista/track range. They also produced children's cranksets, individual chainrings and other small components. The company had a reputation of making slightly (or really) innovative products that were made to a very high quality. Their Mistral dérailleur range, made from a high density, strong plastic, were considered to be amongst the lightest on the market and, certainly, the most colourful. The Mistral range included five (possibly more) colour-coordinated groupsets (both front and rear dérailleurs and "Sintesi" pedals); Pink ("Maglia Rosa" - "Pink Jersey"), Yellow ("Maillot Jaune" - "Yellow Jersey") and Blue ("Squadra Azzura" - "Blue Team" after the Italian national team), Black and Whitest/grey (it would be nice to think that this was the "Milk Race" but probably not). There may have been a green variety but this may just be someone seeing a blue item that had been bleached out in strong sunlight - apparently the blue form was prone to bleaching. A cheaper version of the Mistral rear dérailleurs were produced as the "Mundial" range (with an aluminium jockey-wheel cage and no adjustable barrel spring) but only in black. The Mistral range was not their only colourfull offering. From the mid-1990s Ofmega started to produce the Sierra range, which was mostly appalling. However, there was a spin-off groupo called Sirio. Sirio cranks came in at least two colours, bright pink and acidic green, whereas, the Sierra range came mostly in black, grey and white. It was these groups that had their production moved in Slovakia in 2000. In addition, the Competizione groupset came anodised in red, blue or gold, as well as plain aluminium: The anodised components included hubs, chainrings and pedals. Ofmega made or rebranded components for other bicycle brands, such as Bianchi, Colnago, Legnano, Regina and Avocet. At one point, most of the Avocet component range was made by Ofmega. Often, the rebranding is just an added pantographed logo (in the Colnago case, it is the singature of Ernasto Colnago). However, in the case of Legnano branded components, the logo is engraved into the item. It may be that some items were made by other companies, such as the Simplex, in the late 1980s and 1990s. It is thought that the gear shifters for the "Mistral" range were made by Modolo; the cronos shifters look very similar. However, on close inspection, the two aren't that similar and Ofmega claim to have made them themselves. They made most of the sets, including hubs, cranks, headsets, freewheels, front and rear dérailleurs, as well as odd small parts. Ofmega appeared to have outsourced their dérailleur production to Simplex in 1987 (Michael Sweatman, Disraeli Gears), and some Simplex derailleurs were labelled Ofmega. This lead to an apparent lowering in quality. However, some of their latest items were of a very good standard. Ofmega missing groups (a list of groupsets not yet represented on Velobase): Strada (may be the same as Competizione or Master), Nuovo Competizione, Vega, Acero, Motion, Rover, Sierra, Lusso, BMX, Nuovo Mistral, Vantage 2 (some of these may be after the period). The "BMX" kit that Ofmega made in the period are smaller "Mundial" pieces. The carbon mountain bike cranks and the glorious "Nuovo Mistral" carbon cranks were the last things that Ofmega took to bike trade shows.